You could spend a lot of time posting on social media with little result if all you do is promote content someone else created. We get it. Posting external links is so much easier than sharing your own and it can be difficult to know what to post for yourself. 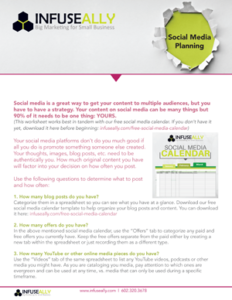 But we want you to be as effective as possible, so we’ve created this worksheet to help with your social media planning. Fill out the form to gain instant access to the worksheet and start building your social media plan.